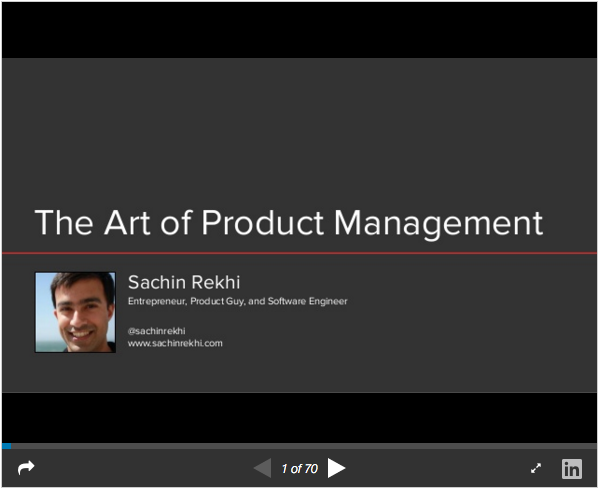 Age of Product’s Food for Thought of February 14th, 2016 covers: The art of product management, how to ship product in time, lean idea validation, key drivers for SaaS success, 20 questions to get up to speed with a new Scrum team, a compact guide to DevOps and continuous delivery, how Facebook ships code more than 1,000 times a day, agile base patterns, how to foster a sense of purpose, doomicorns: how unicorns reached the tipping point, and the resetting of the startup industry. Fear of shipping: "Had we not committed to a deadline, in public, 2-weeks prior to the ship date, I believe we’d still be adding finishing touches." It’s scary to ship. And it’s in our nature to want everything to be perfect before doing so. When working in tandem, these two forces can keep you from shipping for far too long. Great—a sample chapter from Tomer Sharon’s new book Validating Product Ideas Through Lean User Research. 2016 Rosenfeld Media: "Chapter 5: Do People Want the Product?" Based on a talk given at the SaaStr Annual Conference in San Francisco, this slide deck offers a comprehensive and detailed look at the key metrics that are needed to understand and optimize a SaaS business, and how these can be used to drive SaaS success. 20 questions for you — the new Scrum master — that fit into a 60 minutes time-box. Start learning how the new Scrum team is currently working and get up to speed. Download an easy printable template for your convenience. I am here to demystify these practices [CD, CI, DevOps], tell you just how important they are to you “on the business side” and help you get involved. It’s not that complicated, we have pictures and everything. Facebook believes in getting early feedback and iterating rapidly, so it releases software early and frequently: Three times a day for frontend code, three times a day for for backend code. I am amazed that Facebook is able to maintain such an agile deployment process at that scale. Conversation on the “Agile Base Patterns in the Agile Canon” paper by Dan Greening. Basically I went through all the agile methodologies I could think of, looked at their particular practices, and tried to understand what the purpose of each practice was to serve agility. There are five of these patterns. Kimber Lockhart (via Medium): Don’t create a sense of urgency, foster a sense of purpose. Source: Medium: Don’t create a sense of urgency, foster a sense of purpose. Over the last two decades, the software technology stack has undergone a rapid evolution. The evolution continues. Today’s world of smart phones is giving way to tomorrow’s world of smart devices with sensors and actuators and not much more. The app layer will only get thinner. The startup industry may be “resetting,” which doesn’t mean a “crash” but rather just a resetting of valuations, timescales, winners/losers, capital sources and the relative emphasis of growth rates vs. burn rates. This morning, the law firm Fenwick & West published new findings about all the U.S.-based unicorn financings that took place during the last nine months of 2015. It’s rife with interesting nuggets, but perhaps most fascinating is that in the fourth quarter of last year, half of the 12 rounds it tracked featured valuations in the $1 billion to $1.1 billion range — and with terms that were far more onerous than earlier in the year.